Note: From time to time, I solicit guest posts from various individuals on different topics. While I like to think I know a little something about a lot of things, I’m fortunate to be acquainted with a number of people who know a whole lot about certain topics, and who are willing to share some of that knowledge here. In this particular case, I’m welcoming back someone who has written on this particular topic before. We’ve now had a solar system on our house, and an electric car charging from the house, for just over a year. Also of note, in my post last May, I suggested that what we need is a retail electric plan that sells to you at a competitive rate (versus the inflated prices at Green Mountain) and buys from you at the wholesale price (which can climb impressively high on hot summer afternoons, when your solar system is cranking out the juice). Well, plans like this are starting to appear on the market. MP2 Energy has such a plan and others are looking into it. How much electricity did our solar system generate, and our electric car consume, in the past year? Based on our year of data, would we do any better to stick with Green Mountain or go to one of the newer plans? Of course, I’m only writing about our own usage, with our house and our car. Your house and your car and your, umm, mileage will vary, but you might be able to extrapolate from our numbers to reach your own conclusions about whether you want to go solar. How much electricity did our solar system generate? Below is a graph of the energy-per-day produced by our solar array. You can see the system generating more energy in the summer months, with the correspondingly longer days. You can also see the occasional days with bad weather. No sun = no power. How much juice did our Tesla consume? Another way to think about it: the “long tailpipe” problem. Some critics of electric cars note that they still burn fossil fuels, just somewhere far away from home. Our solar array produced enough energy to run our Tesla for nearly 30,000 miles. So if you want to have a “solar powered electric car”, you can do it with even a modest-sized solar system. What if you drive a longer commute? The prior owner of our Tesla lived up in the Woodlands and commuted back and forth to Houston. He was averaging an even more amazing 300 Wh/mile, driving twice as many miles per year in the same exact car. He upgraded to a Tesla P85D (the four-wheel-drive version that goes insanely faster) and his mileage stayed roughly the same. Supercar performance, tiny hybrid efficiency. Lastly, I’ll note that we did several road trips in the Tesla, using their Supercharger infrastructure. I’d estimate that somewhere around 500 kWh of that energy was “free” from the Supercharger network (i.e., included in the cost of buying the car). Should we stick with Green Mountain or switch elsewhere? Green Mountain has the best net metering plan on the market, but there are only two competitors. In a nutshell, Green Mountain buys and sells power from you at the exact same price: $0.12/kWh, inclusive of all fees and taxes. But there are plenty of standard retail plans that will sell you electricity at $0.08 or $0.09/kWh. Can we do better than Green Mountain’s net metering plan? The real issue, once you strip away all the dumb politics, is that the underlying pricing model isn’t at all a flat rate for electricity. Roughly speaking, there’s a wholesale price for the electricity coming from a commercial generator and then there’s a distribution price to get it to you. Wholesale prices vary all day long, with overnight lows below a penny and mid-afternoon highs as much as 3 cents/kWh, with occasional peaks that are much, much higher. CenterPoint charges 3.8 cents/kWh for delivery of that power, no matter what, alongside a flat monthly charge of $5.47 per residential customer. All those charges are often rolled into the pricing plans you see from other retail electricity providers, who are essentially gambling that they can buy power at variable wholesale rates and sell it to you at a flat retail price while still somehow making a profit. When a retail electricity provider wants to get into the solar buyback game, their actual costs to get power downstream to your house (so far as I can tell) are the wholesale price plus the distribution price. Your excess solar power production is worth the same to them as the spot wholesale price when it flows back upstream. CenterPoint doesn’t give any sort of rebate for upstream electricity flows. CenterPoint’s argument: Somebody else is receiving the power you’re sending upstream, and they’re paying to get it delivered. CenterPoint charges for that delivery. Can a retail electricity provider offer a competitive pricing plan that’s closer to the wholesale market structure while still buffering consumers from the sometimes insane spikes of the raw wholesale market? One such provider, who prefers not to be named yet in public, approached me privately and offered me the chance to test drive a new plan they’re working on. Their proposal is to pass through all the CenterPoint charges, as is, and then have a flat 3 cents/kWh for buying and selling power, downstream or upstream. I ran these numbers through my spreadsheet for the same 12 months of data I’ve already captured. Here’s what came out: Green Mountain’s $0.12/kWh net metering plan cost us $692.84 for the year. If we had this new plan instead, it would come out to $712.07 for the same usage in the same year. Evaluating MP2’s spot-price “solar buyback” plan is a bit more complicated, because the upstream price they pay you varies all day long. Conveniently, MP2 did this analysis for me. I emailed them all our data and their conclusion was that our annual bill would be $904.32, so not especially competitive with Green Mountain’s net metering. MP2 also offers a net metering plan, similar to Green Mountain’s plan, but it’s presently offered as part of getting your solar system installed through SolarCity. Thus, not an option for us. Call me modestly bullish on this. Even though MP2’s solar buyback plan isn’t a good deal for our house, other firms are looking to offer variants on the same business model that are competitive. As an added bonus, I’d now be incentivized to put a big battery on our house to capture the excess daily production and reuse it at night. With standard net-metering, there was no incentive, but now I’d save those distribution charges. I’ll still wait for the cost of battery packs to drop, but it’s fun to think about. Solar has a big role to play in stabilizing our grid, because those hottest hours of the day are exactly when solar panels will be generating the most power. Solar also happens to do the job without pollution, and without incurring large infrastructure costs for long-distance power distribution. On top of that, solar’s one-time purchase and installation costs are rapidly shrinking. Consequently, it’s sensible and desirable for the Federal government to continue its solar subsidy, and it would make a lot of sense for the Texas state government to get in on the game as well. The solar on our roof helps our neighbors, not just us. I’m not suggesting that we’ll stop burning fossil fuels, but rather that a diversified set of sources is a desirable way to meet the needs for a stable and scalable power grid. The biggest objection to solar, so far as I can tell, comes from shills who misrepresent the financial structure of the electricity markets and claim that residential solar production leads to “mooching” off the grid. What I like about MP2 and some of the other buyback plans coming online is that they address this concern head-on. By passing through the monthly CenterPoint connection charge and pricing power consumption somewhere only marginally higher than wholesale rates, these new plans make it clear that solar systems aren’t mooching at all. They’re paying their fair share, and they’re improving the reliability of the grid while they’re at it. We’ve only had the solar system since November, so it’s too soon to have full-year statistics. Once the system reaches its first full year anniversary, I’ll run the “profitability” numbers and do another guest post here. Stay tuned for more exciting charts and financial math (present value, IRR, and more)! Instead, I wanted to give some perspective on the economics of solar power. Notably, Tesla just announced a new “PowerWall” contraption that puts a 10kWh battery pack on your garage wall for $3500 (plus hiring an electrician, plus permitting, plus ancillary equipment like inverters, so let’s call it $6000 minimum). Elon Musk envisions that we can truly replace our entirely fossil fuel-based economy with solar power: homes, cars, everything. (For more technical details on the PowerWall products, Teslarati has a good writeup.) Let’s do the numbers, shall we? To begin, here’s our March electrical bill from Green Mountain — the best of the three available plans if you have solar. This is what “net metering” looks like. We drew 862kWh from the grid and fed back 573kWh. Meanwhile, over the same time period, our solar system reports that it produced 853kWh. Of this, the house consumed 280kWh and we sold back the remaining 573kWh. So, our actual power consumption for March was 1142kWh (solar generation plus grid consumption, minus excesses solar generation sold back). I rolled back to last year’s stats, when we had neither solar nor a Tesla, and the monthly usage for the same time period was 864kWh, which says that the Tesla used around 280kWh for the month, or maybe it’s just hotter this year. Last year’s awful summer peaks were well north of 1500kWh, so presumably this summer, with the Tesla, we’re looking at 1800-2000kWh / month of peak usage. Here’s where solar gets fun. 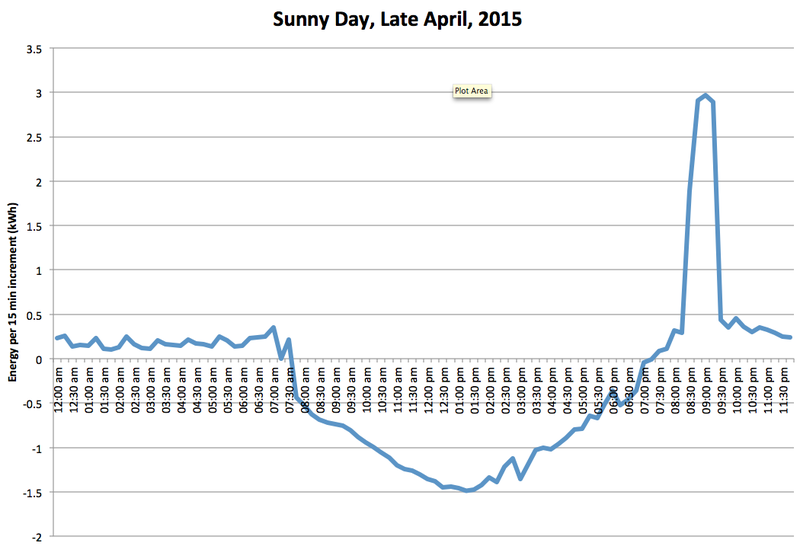 The graph below shows the energy generated by our solar system on a beautiful, sunny April day. Positive numbers represent power we’re drawing from the grid. Negative numbers represent excess power we’re selling back to the grid. You can see our Tesla charging itself up after we got home from eating dinner out. You can also nicely see when the sun came up and when it went down again. On this particular day, midnight to midnight, we drew 20kWh from the grid while the sun was down. The solar system generated 52kWh, and we had an excess of 44kWh that we sold back to the grid (i.e., we consumed a total of 28kWh on this particular day and were a net seller of electricity). Sounds great right? The new Tesla PowerWall contraption leads you to ask the question of whether you could store all that extra energy in a battery during the day and release it at night. If you could do that, you could then cut yourself free from the grid. Today’s question: what would it take to go completely “off grid”? To pull this off, you need to generate everything you might ever need, even in the worst case. So how bad is bad? 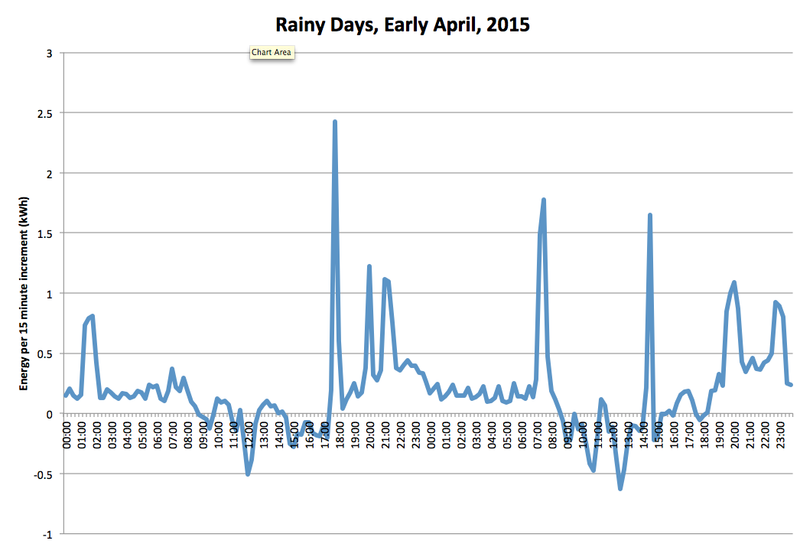 Here’s a chart of our power usage over a two day period in early April when it was rainy and awful. Over these two days, our total power drawn from the grid was 46kWh. The solar system generated 25.2kWh, of which 9kWh was sold back to the grid (i.e., we consumed an average of 31kWh/day on these two days). To make this work “off grid”, we’d need to double the size of our solar system. To make this work on a bad weather winter day, with correspondingly less daylight, the solar system would need to grow yet again. Also, this included a typical day of driving with our Tesla. What if we did a long drive and got home with a near-empty battery? You’d have a whole new form of range anxiety to deal with. Conversely, on days when you generate more than you use you’re just throwing it away. Our current solar system cost us roughly $30k to purchase and install (before the 30% tax credit, which might go down in future years). No matter how you slice it, the profitability of the system is dubious, given how much cheaper electricity became after the Saudis decided to crank up their production. Doubling the solar system, installing expensive batteries, going off-grid, and discarding excess production? Sorry, that’s not financially rational. Incidentally, if you want to know how to size up a Tesla PowerWall system for an off-grid solar application, you pretty much just add up your grid consumption during the night; you need to ensure you have enough solar capacity and battery capacity during the day to cover it. For our house, two PowerWall batteries ($3500/ea, for 20kWh total storage capacity) wouldn’t quite do the job. We’d need three of them to have a decent margin. If you had a bigger house or you drove many more miles on your electric car, then you’d have to ratchet everything up appropriately. Conclusion 1: building a solar system to deal with worst-case power generation, operating your house “off grid”, will require your solar system to be much larger than you’d specify for a net-metering application, where you can rely on the grid for bad-weather days. As solar panels get more powerful and cheaper, the economics of this will change. Today, no. Ten years, maybe. Next question for today: is there any point in buying a PowerWall if not to go off-grid? If what you want is “emergency” service in a power-outage situation, you can buy all sorts of natural gas generators. They’re loud when running and they require regular service, but after Hurricane Ike knocked our power out for ten days, we could feel the soulful allure. Unfortunately, a smaller PowerWall system wouldn’t help here, since for a ten day blackout, you’re really in a situation equivalent to the fully off-grid scenario. Sadly, with only flat-rate grid electricity pricing available here, I conclude that a PowerWall has no real use at our home. Caveat 1: so long as TXU is willing to give you “free nights”, then a PowerWall means free electricity for your home! You can expect TXU to kill that program off quickly once Tesla’s battery packs start shipping. Sorry about that. Caveat 2: electric utilities are cranking up the scare machine that it’s “unfair” for solar consumers to pay less for the grid. First off, this is totally bogus, as we pay the same fixed fee as everybody else pays for CenterPoint to maintain the grid. (Many retail electric plans hide this fee, so long as you use more than 1000kWh, but they’re still paying it on your behalf. ) And if you’re a net provider rather than net consumer of power at peak times, you’re helping the grid. But let’s say the utilities win the argument and kill off or weaken solar net metering. At that point, we’re forced to buy a battery storage system to recapture our excess daytime usage. The grid then loses the benefit of our excess generation, and every new solar system just got more expensive for no good reason. All of this would change if consumers were more exposed to the variable pricing of the commercial power market. Rice University, for example, buys its electricity a full year ahead of time, hour by hour, offset by in-house solar production. If it turns out that Rice pre-bought more than they need, they sell it back on the spot market. If they need more than they pre-bought, they have to go buy power on that same spot market. And, of course, when do they really need it? The same time as everybody else does, on the hottest days, so spot prices can be brutal. With this in mind, typical commercial flat rooftop solar installations point their panels southwest, maximizing their power generation in the afternoon when electricity is most expensive. The real genius of power storage systems is that you can buy and store the power when it’s cheap and uses it when it’s expensive. Energy arbitrage! That means that the mammoth version of Tesla’s PowerWall might be very attractive for industrial and commercial users. Even utilities might deploy them into neighborhoods. And if home users were more exposed to the “real” pricing in the commercial market, they too would be incentivized to get personal battery storage systems, with or without solar, for the same reasons. So far as I can tell, none of the available-in-Houston 325 plans from the 52 different retail electric providers offer hour-by-hour variable pricing like this, but in Austin or San Antonio, your traditional electric utility might be able to do it. Here’s a nice NPR article with useful details. Conclusion 2: so long as consumers have net metering available and are not exposed to variable time-of-day electricity pricing, they won’t be incentivized to buy a battery storage system, with or without a solar system on the roof. There’s really no benefit for Houston consumers today to buy a storage system. Teslarati runs a similar analysis in a state with variable pricing. In Southern California, the PowerWall becomes profitable in 3-5 years, and is unattractive for off-grid. Also, Vermont’s Green Mountain Power, not to be confused with our NRG-owned Green Mountain Energy, is ramping up some kind of joint program with Tesla. Who knows, maybe we’ll see something like it here some day. One parting thought: in the insane, fragmented universe of the deregulated Texas electricity market, where generation, distribution, and retail sales are performed by unrelated players, we’ll probably be stuck with pricing policies that incentivize consumers to waste energy for make benefit most glorious State of Texas. Of course, exposing consumers to the raw industrial electricity market would likely be disastrous. Consumers can’t easily manage their load or trade contracts against future use. The best we seem to get are “smart” thermostats that can throttle back at peak times. Yawn. What seems missing, then, is better regulations for how consumer pricing is structured to incentivize lower peak usage. My proposed solution? Net metering and predictable time-variable pricing should be a standard part of any retail electricity offering. Let me sell high and buy low! Similarly, every plan should be structured to eliminate perverse rate structures where marginal rates go down as usage goes up. That’s common sense. Deregulation! Dan Wallach is a professor of computer science at Rice and a friend of mine who has written four of these analyses before. It’s July and that can only mean one thing: time to worry about my electrical contract for the next year. As we saw in last year’s installment, I ended up going with TriEagle Energy’s 100% renewable product. They want to jack my rates by 10% over last year, so clearly it’s time to run the numbers again. This year, I decided to try to sort out what each plan would cost based on my power usage data for the past year (thanks again to SmartMeterTexas.com). For five months, my usage went over 1000 kWh/month and for seven it was well below. I then downloaded the full spreadsheet of available offers from PowerToChoose.org, built an equation to estimate my monthly charges, and then all I have to is sort to find the cheapest, right? Sadly, it’s not that easy. The spreadsheet data they give you is a disaster. Rather than just listing the fees, there’s now a textual column titled “Fees/Credits” and there’s no standard way in which they’re reported. Some companies report what you’d pay per kWh, inclusive of monthly fees, while others report what you pay exclusive of those fees. This meant I had to go through every row in the table and try to interpret their mumbo jumbo. Deregulation! If you just try to just naively scale the 500 or 1000 kWh numbers, you end up with a wrong answer by 2% or more, but the EFLs often fail to give you enough data to do any better. So, with that caveat, here’s a histogram of how much money I’d spend in a year with each of the nearly 200 fixed rate electricity contracts on offer. Higher points in this histogram mean there are more plans that would end up costing me that price. Can’t we please go back to having a centrally regulated traditional utility company? San Antonio still has this. I had a friend there send me a copy of her utility bill. She’s paying approximately $0.11 / kWh. Her bill breaks out the fixed and variable charges, much like I appreciate from Our Energy. On my histogram above, she’d be somewhere in the far left — getting an exceptionally good rate and not having to do this stupid analysis every year. All of our lovely free market competition in Houston is really just a series of opportunities for fools and their money to be quickly separated from one another. Hey, what about solar power and saving the earth and stuff? Solar works hand-in-hand with the grid. When you install a solar system, it’s generating power during the day that you probably don’t need, and you need power at night that your solar system isn’t providing. This means your meter gets to run backwards during the day and forwards at night. If you have a month where you generated more than you used, you get a negative electric bill, which is then “banked” for future months. (Curious side-effect: you don’t want to over-size your solar system, because you’ll never get all your money back from the “bank”.) Also notable: if grid power goes down, so does your solar system. You can install a backup battery system or a gas-powered generator, but that’s a whole separate animal. What about leasing vs. buying, warranties, etc. In short, a lease is a lot like a loan. You’re paying less up front and you’re making monthly payments. The leasing company is trying to make money. The net effect is that the IRR goes down to the point that the deals are less likely to be worthwhile. (Again, this varies on a state by state basis. Nobody’s subsidizing those leases here.) Solar lease deals also act like an extended warranty on your gear. If your panels aren’t up to spec, they repair them for you. Most solar parts have very long warranties of their own, so this is less of a big deal than you’d think. The environmental impact of solar is less abstract than the premium you pay for a “green” grid electricity plan. No matter what grid plan you purchase, green or not, the same mix of mostly coal and gas-fired generators are still producing the power your house is consuming. The only difference is that you’re paying your utility middleman to also buy you “renewable energy credits”, which are sold by wind farms and other such things and which may or may not be feeding their electrons to your house. It’s at best unclear whether you’re incentivizing somebody to install more “green” generation capacity versus building another traditional plant. On the flip side, when you’re turning sunlight into power, you’re directly removing your demand from the grid. This sort of logic is especially attractive if you’ve got an electric car and you’re worried about the “long tailpipe” emissions problem. Aren’t you just a leach on the electric grid, then? Umm, no. By installing solar, you’re doing the grid a favor by supplementing its power during the peak draws in the hot summer sun. If more houses could run their meters backwards, that would effectively supplement the big generators and help avoid brownouts. Also, you’re paying the same monthly fee that everybody else pays for connecting to the grid. So, what’s your new electricity plan then? I need to pick a new electricity provider now, even though it might be a while before I can get a solar panel system installed on my house. The set of plans that support solar sellback is very small. So far as I can tell, I’ve got precisely three choices: Green Mountain, Reliant Energy, and TXU. The winner among these seems to be Green Mountain, who will buy your first excess 500 kWh/month from you at full retail price and half price thereafter. TXU buys from you at 7.5 cents/kWh no matter what. I can’t seem to find the Reliant number. Green Mountain says you can sign up for any of their plans and switch without penalty to the plan that supports buying your power back from you, so that’s probably the way for me to go. Dan Wallach is a professor of computer science at Rice and a friend of mine who has provided this annual analysis three times before. This story was from earlier in June. Texas’ state legislature failed to vote on a bill backed by Musk’s Tesla Motors (TSLA) that would have loosened the state’s restriction on dealerships owned by automakers. The legislature concluded its most recent session last week, and won’t be back until January 2015. Tesla has tangled with dealership associations in a number of states in its effort to sell its Model S electric sedan directly to consumers rather than using franchised car dealers. Musk testified before lawmakers in Texas on the issue earlier this year. Speaking at Tesla’s annual shareholder meeting Tuesday, Musk cited polling data from various states to argue that consumers overwhelmingly favor allowing direct sales. “Clearly, if democracy was working properly and the legislators were implementing the will of the people, something else would be happening, and there would not be legislation trying to artificially restrict direct sales,” Musk said. See here and here for some background, and this earlier story for more. I’ve compared what Tesla is trying to do to what the craft brewers finally managed to do, and if Elon Musk is as smart as he seems to be, he’ll figure out a way to mimic their tactics. In both cases, the argument in favor of loosening the archaic restrictions is basically self-evident, it’s mostly a matter of getting the public on your side, and educating the legislators, all of whom would favor the changes if they truly understood the concept of a “free market”. It’s a process and not a straight line, and you shouldn’t expect to win without a fight, but I do believe it’s inevitable. It may take awhile, but in the end I believe Tesla will prevail. 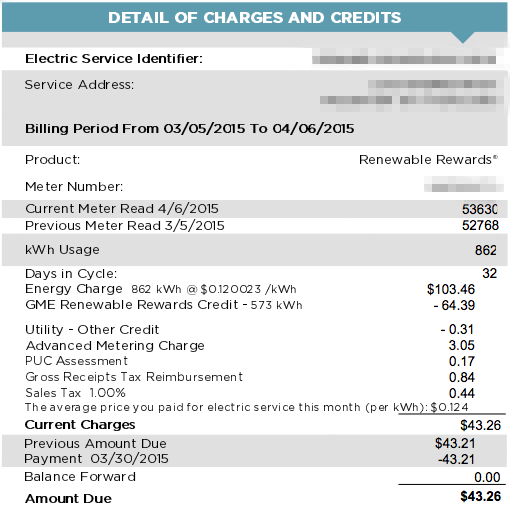 For the past two years, I’ve written a guest blog post here about electrical rates. Let’s do it again, shall we? You’ll notice that, for most of the year, we’re running comfortably under 1000 kWh/month. Well, most of the electricity plans available to us have a $10/month surcharge if you go below 1000 kWh. (You have to read those electric fact labels carefully.) What’s the right way to go shopping then? Turns out, there’s a link at PowerToChoose that will let you download all the terms of every electric plan in one giant CSV file that you can load into Excel. I took that data, stripped out everything except the plans offered in Houston through CenterPoint Energy, and then sorted by the 500 kWh/month predicted cost. Estimated prices range from $48/month to $89.70/month. Cutting to the chase, who’s got the best deal? If you want a fixed rate 12 month term, the winner turns out to be TXU’s “Energy Saver’s Edge 12”. Summer Energy is slightly cheaper with a 6 month term, but then you have to do it all again in 6 month. If you want a “100% green” power source, the winner is TriEagle Energy’s “Green Eagle 12”. At least, that’s who would have the best deal for me, given my electric usage. Just for fun, here’s a frequency distribution chart of these prices, focused on what you’d pay for 500 kWh/month, which is the more relevant number for me. The y-axis tells you how many plans would cost you each given price (within a bucket size of $1.50). I’ve plotted frequency charts for only the fixed-price plans, and I’ve separated out the renewable ones (typically “100% renewable”) from the others. I’m not entirely sure what to make of this except to say that there are a whole lot of uncompetitively priced plans out there, and the gap between “100% renewable” and other plans has largely disappeared from the market, unless you’re looking for strictly the lowest priced plans out there. At least in my case, the TXU cheapo plan looks like the way to go. Even then, if you read their fine print, I’d get assessed a fee if I ever went below 500 kWh/month, but since that hasn’t happened at all in the past year, I’m not going to worry about. I always find it perverse when I have a disincentive to make my house more power efficient. Say I replaced a bunch of our power-hungry halogen bulbs with LED bulbs. I might drop below 500 kWh/month in the winter and end up spending more money. That’s fantastic. But wait! I downloaded all of this data on May 30 and that’s when I told TXU to switch me. Somehow, their computer switched me from the “TXU Energy Saver’s Edge 12” plan to the “TXU Energy e-Saver 12”. Sounds similar, right? In fact, the 500 kWh/month estimated cost for the new plan is $74/month versus the $54/month that I was expecting. Talk about bait and switch! My guess is that TXU rolled out new plans on June 1 and silently moved me from the original, competitively priced plan to the new, embarrassingly uncompetitive plan. It’s a good thing I had all the original data saved when I called, and then had to talk to a supervisor, and so forth. After 41 minutes of “we’re terribly sorry for the inconvenience” and peppy hold music, all I know is that they’re “investigating” and will get back to me in a few days. Incidentally, Summer Energy, my current electrical provider, is June 3rd’s winner, with an estimated $50/month for 500 kWh/month of usage with a one year lock-in, so long as you use the proper promo code. 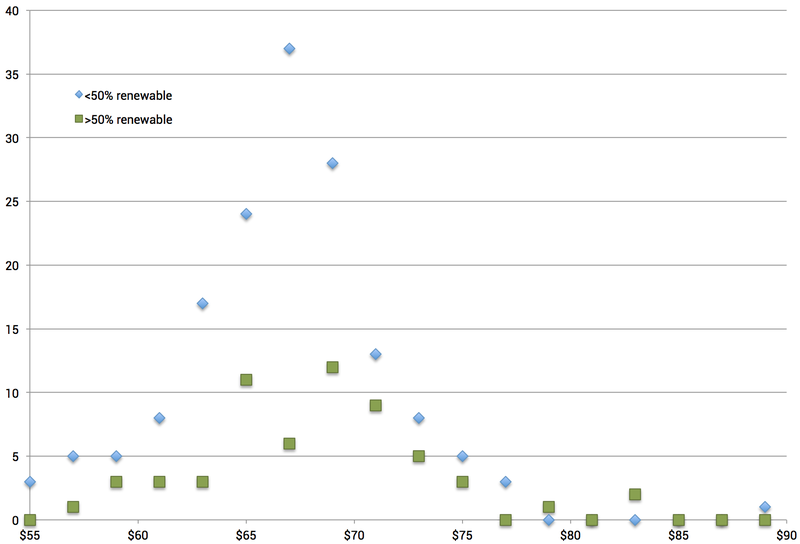 TriEagle’s “Green Eagle 12” continues to be the cheapest “100% renewable” plan at $56/month. Part of me wants to just dump TXU ($54/month, if everything goes my way) and instead go with one of these others. The other part of me is just curious to see what TXU will do next. Behold the power of electricity deregulation! NEVs are Neighborhood Electronic Vehicles, and they are now street legal in San Antonio. The City Council voted Thursday to approve the use of supercompact neighborhood electronic vehicles, or NEVs, on city streets with posted speed limits of 35 mph or less. The ordinance takes effect immediately. The small four-wheeled electric vehicles must conform to the Federal Motor Vehicle Safety Standards for low-speed vehicles and include seat belts, rearview mirrors, head and tail lights, a windshield made of safety glass, a parking brake and a conventional vehicle identification number. Owners will still have to have liability insurance, vehicle registration and display license plates. As a gasoline-free option with no tailpipe emissions, NEVs are being touted as a green alternative. This makes a lot of sense. For basic short-trip driving in your neighborhood, you shouldn’t have to hop in your Chevy Subdivision if a little Renault Twizy or the equivalent would do. If you’re a typical two-car family but you do most if not all of your highway and heavy-duty driving in one of the cars, wouldn’t it be nice to have the option of a second vehicle that’s a lot cheaper to buy and operate than a regular car? By the same token, it makes sense for the city to restrict where these things are allowed to operate – state law says on streets where the top speed is 45 MPH, the San Antonio ordinance says 35 MPH, I might have gone down to 30 MPH since I’d be a bit leery about driving a NEV on a main thoroughfare like San Pedro in San Antonio or Westheimer here in Houston. You used to see vehicles like these in downtown Houston, but I’m sad to learn that REV Eco Shuttle had ceased operations in December. Anyway, I don’t know what the demand for NEVs are in Texas, but surely it makes sense to accommodate them in some fashion for those who do or would want to use them. I’m pretty sure the dealers will win this round, but I doubt they can win in the long run. Texas auto dealers and their lobbyists in Austin are targeting legislation that would allow Tesla Motor Inc. to sell its all-electric vehicles directly to customers — upending a longstanding protection of dealers in state law. After quickly compromising on or abandoning interest in other bills, dealers have dug in their heels after a Texas House committee this week advanced a bill that would permit the Silicon Valley-based company to circumvent a mandate that automakers sell new cars and trucks only through franchised dealers. “They’re looking to take the franchised dealer out of the loop,” said April Ancira, vice president of operators for the Ancira Auto Group. Lobbyists with the Texas Automobile Dealers Associations concede that Tesla, which sells all-electric sedans, is a small niche player. But dealers fear even the narrowest of legislation could open the door to other manufacturers that would like to cut out the middleman. “For (TADA) to claim that restricting competition is in the best interests of the public is wrong and defies obvious common sense,” [Tesla CEO Elon] Musk said in a statement. He has visited the Capitol several times recently, hoping to foster support for the legislation among state lawmakers. I’ve compared Tesla to microbreweries, and it’s in the response from the dealers that the parallel becomes apparent. Tesla’s a small new player in a niche market that has a different business model that doesn’t fit with what the big established players do. More to the point, existing decades-old laws preserve the status quo and make it impossible for the new player to operate the way it wants to. The new guys go to the Legislature to get a bill passed that would carve an exception into the laws for their business, and the established guys go ballistic. My favorite part is where the established guys claim that by restricting the ways that consumers can buy the products they all make, they’re protecting the interests of the consumer. In the meantime, legislators who aren’t terribly familiar with the new business model but who hear a lot from the established guys about how dangerous this newfangled stuff is, are hesitant to take action. As they say, it’s deja vu all over again. But here’s the thing. The new guys have tapped into something that a small but growing number of people want, and those people are passionate about it. They don’t accept that what they want is dangerous, and they have no desire to be “protected” from what they want. Over time, the new business model becomes more familiar, and more legislators come to understand and support it. It takes a few sessions, and a lot of grassroots organization, but eventually enough pressure builds up to force a way in for the newbies. Obviously, I’m projecting for Tesla. I’ve not heard of a movement to replicate what the fans of craft beer have done as yet. But I think Tesla is smart enough to recognize that this is the best way forward for them, and like the microbreweries they benefit from the fact that the existing setup is archaic and stifling and makes no sense. It’s hard to defend the indefensible, and sooner or later something has to give. I don’t know how this will play out, but my money is on Tesla, or whoever succeeds them in the marketplace, eventually winning out. It’s just a matter of how long it takes. What does Tesla Motors have in common with microbreweries? Both are forbidden by archaic laws from selling their wares direct to the public. I’m just curious – has anyone ever explained to Dan Patrick how capitalism works? What he said is true of any product or service on the market. Last I checked, auto dealerships can go belly-up, too. To put it bluntly, this is nuts. Laws like these, in the automotive industry and the beer-making industry, do nothing for consumers, but do ensure a tidy piece of the action for a privileged set of middlemen. I can’t imagine too many people will want to buy a car direct from a manufacturer – most of us have at best a vague idea of what we want in a car, which is why we go to dealerships and take test drives and so on – but I can’t think of any reason why someone who does know what she wants should be prevented from doing business directly with the source. If Dan Patrick or anyone else is truly concerned about the risk such customers may be exposing themselves to, they can insist on including some strong consumer protections in the law that Tesla is seeking. Ideally, the exception Tesla is seeking to carve out really ought to be a general one for all automakers, but the bills are narrowly tailored to just them because everyone is already freaking out about it. The Lege can be a very weird place sometimes. As with the microbrewers, it will take Tesla more than one session to get enough buy-in on this to get a bill passed. I hope they’re in business long enough to see it happen, if only so Dan Patrick doesn’t get to say “I told you so”. See also this Trib interview with Elon Musk, and Texas Politics has more. Environmental Defense Fund (EDF) [Monday] released a report titled “Review of Texas’ Clean School Bus Programs: How Far Have We Come and What Is Still Left to Do?” This report evaluates each of the clean school bus programs in Texas, reviews accomplishments, and offers suggestions for improvement. Diesel engines power most of the estimated 480,000 school buses in the United States, and the World Health Organization recently classified diesel exhaust as a known carcinogen, specifically noting a causal link between exposure to diesel exhaust and lung cancer. One of the most dangerous components of diesel exhaust is particulate matter (PM). The Environmental Protection Agency (EPA) is particularly concerned with these smallest-sized particles, because they are known to aggravate asthma, cause lung inflammation, lead to heart problems, and increase the risk of cancer and premature death. Texas children riding to school in buses built before 2007 may be breathing air inside the cabin of the bus that contains 5-10 times higher the amount of diesel pollution than found outside the bus. These older bus engines spew nearly 40 toxic substances and smog-forming emissions. Children, who breathe in more air per pound of body weight than adults, are therefore exposed to even higher health risks because their lungs are still developing. As of the 2010-2011 school year, the Texas Education Agency reported that nearly two-thirds of current school buses were over six years old, emitting at least 10 times as much PM as older buses, and much more in many cases because a large proportion of the fleet is even older. More than 700,000 children are impacted, meaning that nearly half of the students relying on school buses for transportation in Texas still ride dirty buses. There are two current programs available to help retrofit or replace the remaining 17,000 dirty schools buses in Texas. Under the Texas Clean School Bus Program, The Texas Commission on Environmental Quality (TCEQ) is accepting applications for grants through November 30. This is a comprehensive program designed to reduce diesel exhaust emissions through school bus retrofits. All public school districts and charter schools in Texas are eligible to apply for this grant. Private schools are not eligible for funding. Public school districts that lease buses are also eligible. EPA also launched a new rebate funding opportunity for school bus replacements under the Diesel Emissions Reduction Act. Applications will be accepted from Nov. 13 to Dec. 14. The first round of rebates will be offered as part of a pilot program and will focus on the replacement of older school buses in both public and private fleets. If the pilot proves successful, EPA will look at rebates for other fleet types and technologies. The report is here, along with supplemental information. 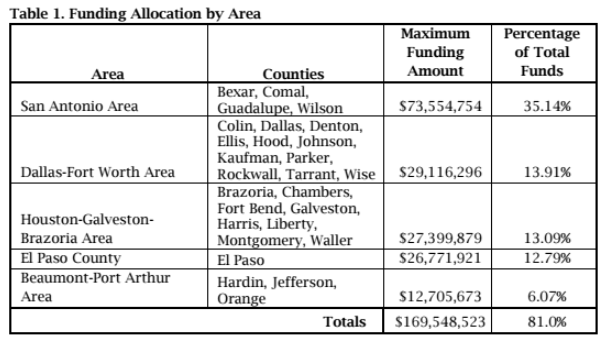 The deadline for the TCEQ grants has been extended to December 14. I had no idea any of this existed, so it’s good to know and good to see that we’re making progress. Many buses can be effectively retrofitted, but some will need to be replaced. Perhaps this will be an opening in the state for the electric school bus industry. In any event, check with your school or your local school board to see what’s being done for your kids. It doesn’t take too long for visitors of Mueller, a 700-acre master-planned community in Austin, to realize that the neighborhood is peculiar. The planned community, built on the site of the former Mueller airport, boasts almost too-perfect rows of homes with cheery pastel exteriors and quaint front porches. And then there are the neighborhood’s green flourishes—solar panels that adorn every other rooftop and the eco-friendly hybrid cars that roll almost silently through the development’s tidy streets. Mueller isn’t just a subdivision—it’s a life-size green energy research test site. The New Urbanist, a mixed-use development, is home to a five-year “smart-grid demonstration project” led by Pecan Street, Inc., a nonprofit research and development organization focusing on green energy, and Austin Energy. In late July, General Motors announced that it is partnering with Pecan Street, making 100 Chevy Volts available to Mueller residents to buy or lease. Since February, Pecan Street has been providing financial incentives for residents to join, matching the $7,500 federal tax credit extended to owners of electric vehicles with their own $7,500 rebate. Those who opt to lease will receive a $3,000 rebate. Mueller’s 600 residents are currently using about sixty electric vehicles, according to Colin Rowan, Pecan Street’s director of communications, and 52 of those vehicles are Volts. Now, the recent influx of electric cars in Mueller has allowed Pecan Street to test the impact that high concentrations of electric cars might have on the area’s smart energy grid. For 16 years, OnStar has been communicating with GM customers in their cars, usually in times of emergencies. But now the company is re-imagining itself to also be an energy manager for a fleet of electric vehicles. The electric vehicle market is minuscule today, but some day, they could potentially serve as a fleet of mobile batteries that could store power until it is needed by a homeowner or grid operators during peak power demands. Until now, OnStar’s experiments have been limited to small demonstration projects or work in the lab. Now they want to begin test-driving their theories with Austinites. Among the possibilities are taking advantage of different rates for different times of day for cheaper charging, and using the stored energy in car batteries to help power one’s house or give back to the grid in times of high usage. This real-world experiment is set to run through the end of 2014. Very, very cool. What City is this you ask? Innovation, creativity and a black gold rush spirit dominated industrial Houston at the turn of the last century – putting Houston on the map as an economic leader. What are these building blocks? Recently, Forbes Magazine placed Houston as the number one city for young professionals. And young professionals drive innovation and use new thinking to solve old issues. Houston has a business-friendly environment and a plethora of large companies conducting business in new ways. Houston has high average incomes and a concentration of graduates from elite colleges from across the country. Also, for the first time in thirty years, the Kinder Houston Area Study revealed a significant increase in the number of residents who support mass transit and prefer a less automobile-dependent, more urbanized lifestyle. 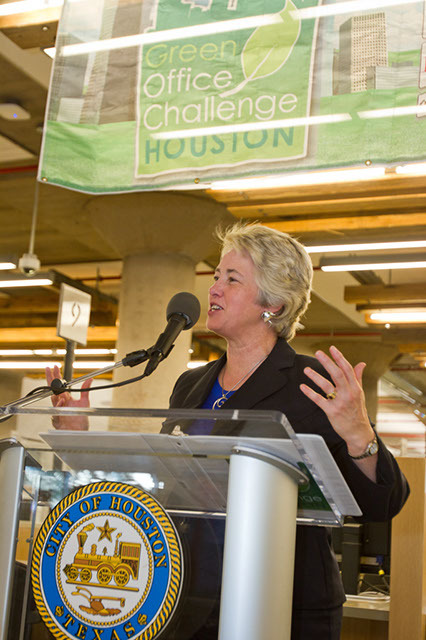 And Mayor Annise Parker’s forward-thinking and innovative approaches and initiatives are putting Houston on the map as a national green leader. 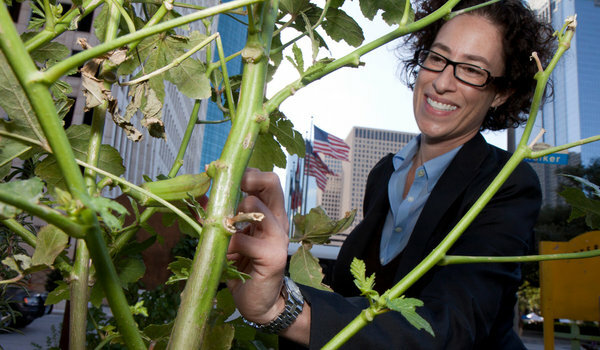 What’s most exciting about Houston is that few people think it will lead the green revolution. But this sleeping giant is starting to awaken. Houstonians love a good challenge and love to save money. The City has a robust partnership with the University of Houston’s College of Architecture’s Green Building Components Program. Their innovative faculty has designed the first movable solar powered office/generator, and the City, through a grant, has purchased 17 of these units for emergency preparedness and other uses. Houston also recently received two large grants to reduce the cost of solar for residents and test out new types of rooftop solar technology. 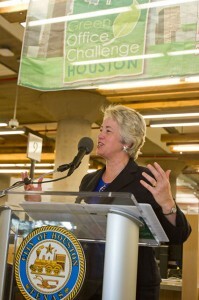 The City also wants energy efficiency to be part of the urban fabric of Houston. Through our Residential Energy Efficiency Program (REEP), led by the General Services Department, the City has helped 13k Houston residents weatherize their homes, resulting in 12-20% kWh reduction and $60-125 savings each month. On the commercial side, the award-winning Houston Green Office Challenge and the City’s partnership in the DOE’s Better Buildings Challenge are encouraging building owners and property managers to find innovative measures to reduce their energy and water consumption and decrease waste. We also know that equally important to encouraging high performing buildings is looking at our codes. In January 2012, the City, with leadership from the Public Works and Engineering Department, set the bar high by adopting the Houston Residential Energy Code. This code makes Houston’s standards 5% above the state code for residential energy efficiency standards, and also requires all new residential buildings to be solar ready. And Houston is poised to adopt another 5% increase above state code this year. It’s not just about energy efficiency. Houston also embraces green buildings. Currently Houston is number four in the nation in the number of LEED certified buildings with 186 certified projects. That’s up from #7 just a year ago. In addition to electric, CNG is offering cleaner, cheaper fuel for additional options: In a partnership with Apache, the Airport’s new parking shuttles at IAH are being powered by natural gas. 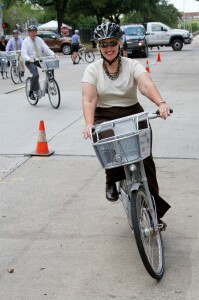 With the launch of Houston B-cycle, the City’s bike share program is now a reality with 3 stations and 18 bikes in downtown, with $1 million in committed funding to grow to 20 stations and 225 bikes by the fall of 2012. This grant-funded program offers a transportation alternative for citizens and will help address pollution issues, traffic congestion, and rising oil costs. And the City, under the leadership of the Houston Parks Board and the Houston Parks and Recreation Department, recently won a $15 million highly competitive U.S. Department of Transportation’s 2012 TIGER grant. This project will assist in eliminating gaps in Houston’s bike grid: the project includes building 7.5 miles of off-street shared-use paths, 2.8 miles of sidewalks, and 7.9 miles of on-street bikeways. And the dream and vision behind the Bayou Greenway project is becoming more of a reality. This proposed linear park system is unrivaled in its breadth and scope. 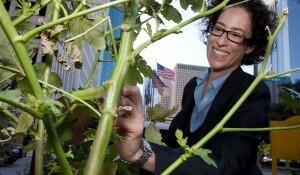 Finally, sustainability must encompass urban agriculture. The City Gardens and Farmers Market Initiative supports urban gardens and markets: the City has planted numerous new vegetable gardens (some of which are highlighted in First Lady Michele Obama’s new book, American Grown) and, with its partner Urban Harvest, has encouraged the sale and purchase of local food by starting a weekly farmers market at City Hall, with over 40 vendors. In addition, the Mayor’s Council on Health and the Environment created an obesity task force to look at the importance of healthy eating and exercise. The Healthy Houston initiative will review and implement sustainable food policies for Houston to create work, school, and neighborhood environments conducive to healthier eating and increased physical activity. And under the leadership of Councilmember Stephen Costello, Houston is working to minimize food deserts and increase food access. The New Houston is here, and it’s on a roll. Laura Spanjian is the Sustainability Director for the City of Houston. Learn more at http://www.greenhoustontx.gov, http://www.facebook.com/greenhoustontx and http://www.twitter.com/greenhoustontx. The city of Houston has made significant investments in energy savings. 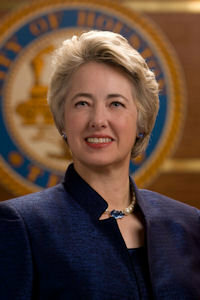 The U.S. Conference of Mayors named Mayor Annise Parker the winner of Mayors’ Climate Protection Award last year for green building initiatives that incentivize conservation and energy-efficient design features. “We don’t do it just because we get attention. We do it because it’s been good for the city’s bottom line,” Parker told City Council in introducing Laura Spanjian, whom Parker hired two years ago to fill the director of sustainability position she created. A bike share program scheduled to expand to 200 bikes at 20 kiosks in downtown, Montrose, the Heights, Texas Medical Center and the Museum District by year’s end. Four wind turbines to be placed atop the Houston Permitting Center on Washington Avenue. A plan to retrofit 297 city buildings to reduce energy use by 30 percent. Energy savings are expected to cover the cost of the alterations within a decade. Near completion of replacement of incandescent bulbs at the city’s 2,450 intersections with traffic signals with LEDs, which are expected to cut energy bills by $3.6 million a year. A lot of this investment has been paid for with federal stimulus dollars, which is important because the city’s budget, like those of many other cities, can’t often afford the up front cost of such investments. Taking advantage of those funds while they were available was smart and will pay off for years to come. [CM Oliver] Pennington and others also asked about the most visible of green initiatives – recycling. More than a third of the city’s homes do not have curbside recycling pickup. Of those that do, only half have the 96-gallon containers. “The challenge is recycling costs more money than picking up trash. Since we’re the only major city in America without a garbage fee, there is no economic incentive. The constraint is entirely budgetary,” Parker said. I’ve asked about that before as well. Basically, the city generates revenue from the recyclables they collect, and when they have enough of that revenue they buy another truck to do the single stream curbside collection, thus expanding the service. I was going to say that I had not heard of any recent expansion announcements or other news concerning the program, but now I have. [Solid Waste Management Department Director Harry Hayes] said that if Council would agree to a recycling fee of $3.75 to $4 a month per household, though, by the end of the year he could have a 96-gallon green recycling barrel at every home in the city and the people and trucks in place to pick it up. That would be “instead of whenever” if he cannot get the fee, he said. That doesn’t mean it can’t be done without charging households directly. In fact, Hayes said, he plans to bring the big green barrels to 30,000 to 50,000 additional homes in the coming year. He won’t say which neighborhoods are first in line until he makes a formal proposal later this spring. The city picks up garbage at 375,000 homes. Currently 105,000 homes have single-stream recycling — the big green barrels. Another 100,000 homes have dual stream recycling — the small bins. Residents have been clamoring for expansion of recycling. An enterprise fund separates an operation from the general fund. That means it is no longer funded by property and sales taxes. But the fund takes in money through fees. Current examples include the city’s airport and water systems, which charge customers, not taxpayers, to fund their operations. The proposed study would examine whether to create an enterprise fund to cover the city’s three solid waste transfer stations. The stations are drop-off points for the trucks that make curbside collections and the pickup sites for much larger trucks that haul the garbage off to a landfill. The stations save city and company trucks from having to drive clear across the city to a landfill each time they fill up. The city already charges the companies that use the transfer stations. If the study recommends an enterprise fund and the Council approves one, the city’s Solid Waste Management Department would keep the money the users pay instead of forwarding it to the city’s treasury. I know a lot of people in neighborhoods that don’t have single stream recycling that would gladly pay the fee to get it, but I wouldn’t claim that’s a representative sample. I suspect the idea would be well received, but we’ll know more after today’s Council meeting. What do you think about the idea? From the Texas Green Report. NRG Energy has committed $10 million to launch America’s first privately-financed electric vehicle charging network and plans to fully wire Houston to support electric cars without straining the grid in the next couple of years. NRG is operating through eVgo in North Texas and is expected to build 70 electrical charging stations by the end of March. Tokyo only needed 60 fast chargers to be fully wired, or only needed 60 chargers to facilitate all vehicles in the city, and Houston is expected to be fully wired with only 50-150. eVgo’s “Freedom Stations” have both level one (110V) and level two (208-240V) chargers that will be open 24/7. Thirty five should be completed in Houston by Labor Day with an additional 25 in Dallas. NRG plans to fully expand to the “Texas triangle” of Austin, San Antonio, and Dallas-Fort Worth. As Dallas and Houston convert to EVs fewer emissions will be released, and the air quality in both cities should improve; more so, Green Mountain, which is owned by NRG, produces all energy from clean sources, including wind turbines in West Texas, so cars can be driven without emissions and have power from non-polluting power plants. This has been your They Might Be Giants moment for the day. You’re welcome. There’s a lot to like about this. Bus maker Trans Tech Bus this year said it would start making an electric school bus in a partnership with Smith Electric Vehicles. The eTrans bus is one of a new generation of zero-emission electric and hybrid-electric models that are slowly making their way to school districts around the county. It’s hard to imagine the bulky, boxy school bus at the forefront of clean-energy and fuel-saving technology. Most buses run on diesel fuel, get mileage in the single digits and have the aerodynamic profile of, well, a school bus. But school buses are almost ideally suited to be electric vehicles. For one thing, they cover fairly short distances on their daily runs, rarely leaving city limits on the way to and from school. And they follow set, predictable routes. That reduces the chances of a bus accidentally running out of battery power before it finishes its route and returns to the lot. What’s more, school buses make frequent stops. While that’s bad for fuel-efficiency on a conventional gasoline or diesel vehicle, electric vehicles can capture some of the energy used in applying the brakes to recharge their batteries, extending their range. One big plus: School buses are off the streets sitting in a depot for much of the day, giving them plenty of time to recharge their batteries. That story was published on December 28, so “this year” refers to 2011. See here and here for earlier stories about Trans Tech Bus. These buses will save school districts a lot of money over the long run in fuel, and would be a boon for air quality by taking a bunch of nasty diesel engine vehicles off the street. Only one problem, of course, and that’s the startup cost of buying a bunch of these electric buses, which cost more than regular buses. In a more functional society, we would see this for the excellent investment that it is and create a funding source to help school districts defray these expenses, but alas, we don’t have one. But hey, it’s a new year, there’s an election coming up, and if you can’t hope for better now then when can you hope for better? Regardless of anything else, I do hope HISD takes a look at these alternatives to diesel-fueled buses. This is the direction they and many other school districts need to be going. The Dallas Transportation blog comes out in favor of an old favorite. Our newspaper ran an editorial today about fighting the problem of uninsured motorists, those miserable characters who have complicated many of our lives. The news peg was a story by DMN Austin correspondent Terry Stutz on the latest scofflaw figures. Here’s what the editorial didn’t mention as a possible solution: Putting a surcharge on the price of gasoline as a way to guarantee liability coverage. That way, everyone would pay into a liability pool and it would be impossible for any driver to duck the cost the rest of us must bear. Paying at the pump would establish a liability pool so we could lower our costs of uninsured motorist coverage, presumably. Those of us who wanted, could go into the market and buy added coverage against theft and collision and higher coverage limits. Paying an insurance surcharge at the pump could also lead to a fairer way of charging people for coverage — those who drive more would pay more, and Grandma would pay less if her driving consists mostly of short hops to the grocery store and church. The LA Times writes that kind of coverage is available in a few dozen states now. I didn’t know that. Scott Henson at Grits for Breakfast has been writing about the pay-at-the-pump approach for awhile. I agree with him that it would be a long shot to get through the Legislature. The current price structure clearly works for insurance companies now, and from their point of view, why change it? I’ve not written about this as often as Grits, but I’ve been in favor of this idea for some time. In contemplating it now, I can think of one objection, which is that there isn’t necessarily a tight correlation between how much gas you buy and how much you drive. How would you fairly charge owners of electric and hybrid cars for this? Yes, there are public car-charging stations now, and surely those could be adjusted to add in an insurance surcharge, but people can also charge their cars at home. You could add a fee to their vehicle registrations, but to say the least that would be a blunt instrument. Certainly, any connection between how much they drive and how much they are charged for insurance would be lost. And as the new fuel efficiency standards are phased in, there will be more and more serious disparities between different drivers and the amount of gas they buy. There may be some way of dealing with this, but I can’t say I’ve seen it discussed anywhere. I still support the idea, but this does need to be addressed. Houston became the first major U.S. city to announce an electric vehicle charging network in November with the launch of NRG Energy subsidiary eVgo. Now it’s finally getting the chargers to match the announcement. A number of electric car owners signed up with the company for in-home charging stations in the past year, but this week will see the opening of the first of the network’s public charging stations. The so-called “Freedom Station” will be located at the H-E-B Buffalo Market at the intersection of Buffalo Speedway and Bissonnet Street. Each station allows for two cars to charge simultaneously. They will have a 480-volt DC fast charger able to charge an EV at a rate of 160 miles of range per hour (or about 30 miles in as little as 10 minutes) and a 240-volt Level 2 charger that can add up to 25 miles of range in an hour. Here’s a subsequent article with a bit more. [Mayor Annise] Parker pitched what she calls Houston Drives Electric as a continuation of the innovative, entrepreneurial spirit that has characterized Houston from its origins. Parker said the city figures to save at least $7,000 per car in fuel and maintenance costs in the first three years of the 25-car electric-only fleet it will purchase by the end of the year. The city also has retrofitted 15 of its existing hybrid vehicles to charge off the stations. In addition, the city is installing 56 charging stations of its own – half in the City Hall parking garage to service the municipal fleet and half for public use at libraries, Hermann Park, the Arboretum and other parks. The city stations are funded by state and federal grants. Three more of the NRG stations will open within the next week, including one downtown, and a total of 50 are slated to open by the end of 2012. Expect to see more of these around the country in the next few years as well. Oh, and if you feel like banging your head against your desk, go wade through the comments in that Fuelfix post. If ignorance were a fuel source, we wouldn’t need to drill for oil. The nation’s fourth-largest city, the sprawling capital of the oil industry, has recently embarked on a variety of green initiatives in an effort to keep up with the times and, it hopes, save money. The local-food craze is the most visible of these efforts, with the opening of the weekly farmers market in October and the planting of nearby Michelle Obama-style vegetable gardens tended by city hall staff members. But Houston is also transforming itself into an electric-car hub, a national leader in wind-power investment and an advocate for energy efficiency. “It’s a city rethinking what it needs to be successful,” says Stephen Klineberg, co-director of the Kinder Institute for Urban Research at Rice University. In recent decades, Klineberg says, as Houston’s economy has diversified beyond oil, the city has realized that it needs to pay attention to quality-of-life issues if it wants to attract talented people. I’m a fan of the goals here, but I don’t know how much effect Spanjian’s efforts can have on the problem Klineberg identifies. Can’t hurt, but it’s my opinion that the best antidote Houston has to this is good word of mouth from those of us who do live here, and especially those of us who move here. Being on the cutting edge of green technology will help, too. 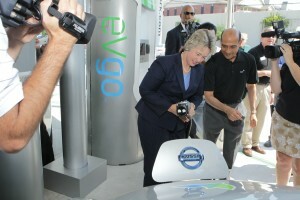 Perhaps Houston’s most publicized initiative involves electric cars. Starting early next year, the city — which already has plenty of hybrids among its fleet — will become among the first recipients of Nissan’s all-electric Leaf. The city government is expecting to buy 30 of the cars next year with financial help from the federal government. Earlier this month, the electric company NRG Energy rolled out an initiative to put in 50 public charging stations around the city by mid-2011. Of course, electric cars will do nothing to ease Houston’s infamous traffic and sprawl. “If you’re going to be a car city, you might as well acknowledge that and help people get into cars that don’t pollute as much,” Parker says. The city is also considering California-style incentives that would allow electric cars into the high-occupancy-vehicle lanes or reduce their tolls. The city also wants more light-rail lines. The article doesn’t go into any detail about that last sentence, which at this point is just as well. As far as the electric cars goes, I’m hopeful. I’m also curious if anyone will be tracking electric car ownership in Houston going forward, to see if there are more of them per capita than in cities that don’t have any charging amenities. Seems like something you’d want to do. Anyway, it’s a good story, so check it out.